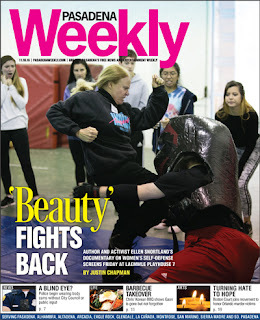 Read Justin's cover story on Ellen Snortland's film 'Beauty Bites Beast'! Ellen Snortland first published her book “Beauty Bites Beast: Awakening the Warrior Within Women and Girls” in 1999. A powerful treatise calling for women to take charge of their own self-defense both verbally and physically when being attacked, she has spent the past 10 years turning the book into a documentary of the same name. The film just finished a weeklong run in New York City and begins a second weeklong run starting tomorrow at the Laemmle Playhouse 7 in Pasadena. The film will air four times a day until Nov. 17 as part of a campaign to make the documentary eligible for the Academy Awards and Independent Spirit Awards. The documentary is a natural extension of Snortland’s lifelong work around women’s self-defense. She serves on the board of IMPACT Personal Safety, a nonprofit started in 1985 that trains women, men and children in full-force, full-impact self-defense and boundary-setting techniques. She grew up in Colorado and South Dakota, received a juris doctorate from Loyola Law School, founded the first all-female theater company in the early 1970s, acted in and directed several TV shows during the 1980s, attended United Nations world conferences and annual UN meetings as an nongovernmental organization (NGO) delegate and journalist and wrote and performs a one-woman show about growing up as a Norwegian American. She is also the co-author of “The Safety Godmothers: The ABCs of Awareness, Boundaries and Confidence for Teens” with Lisa Gaeta. The documentary was funded entirely by individual contributions as small as $5 all the way up to $100,000. The project has cost about $250,000 as well as another $250,000 with in-kind contributions. In partnership with Providence Entertainment Group and El HaLev, “Beauty Bites Beast” screened in Israel earlier this year and has been accepted into the Nova Scotia Sunrise and Delhi International film festivals. The documentary was scheduled to play at the 40th Montreal World Film Festival in September, but managerial and financial problems led to last-minute resignations of many staff members and cancellations of two-thirds of screenings. “Beauty Bites Beast” played for 12 minutes before the projector broke down. One of the festival jurors was found dead in his hotel room. (Read Snortland’s column “When ‘Best’ Isn’t Good Enough” in the Oct. 6 issue of the Weekly for the full story). Undeterred, Snortland is aiming high by applying for the Academy Awards and the Independent Spirit Awards because she believes the film’s message is so important that it saves lives. The documentary points out that the Violence Against Women Act of 1993, its reauthorization in 2013 and the White House Task Force on Ending Sexual Assaults Against Students in 2014 include no mentions of self-defense. The documentary came about after Snortland met an American in 2006 who owned a factory in Tijuana. At the time, hundreds of women were being kidnapped, raped and killed in Juarez. The factory owner read the “Beauty Bites Beast” book and asked Snortland to train his female workers in Tijuana on how to defend themselves. She agreed, as long as she could film the sessions. Those scenes are among the most powerful in the film, showing impoverished women undergoing a remarkable transformation in realizing that they are not powerless to defend themselves. Dolores Huerta, co-founder of United Farm Workers, delivered their graduation speech at the end of the sessions. Dr. Munazza Yaqoob of the International Islamic University invited Snortland and her husband Ken Gruberman, who serves as co-producer of the film, to screen “Beauty Bites Beast” to a group of 300 Islamic female scholars and researchers at the Critical Thinking Forum in the Pakistani cities of Islamabad, Karachi and Lahore early next month. “We are blown away by the prospect of sharing the liberating message of ‘Beauty Bites Beast’ with young female Islamic scholars who are ready, willing and able to take on shifting the conversation about ending violence against women,” Snortland wrote on the Indiegogo campaign she created to help fund the trip. For more information, visit beautybitesbeast.com.